As we followed the thread of VPNFilter infections, it became clear that MikroTik network devices were heavily targeted by the threat actor, especially in Ukraine. Since these devices seemed to be critical to the actor's operational goals, this led us to try to understand how they were being exploited. Part of our investigation included the study of the protocol used by MikroTik's Winbox administration utility. In this blog, we'll share how and why we studied this protocol, as well as the decoder tool we developed as a way of helping the security community look into this protocol for potential malicious actor activity. Multiple tools that could be utilized to identify additional victims accessible from the actor's foothold on devices compromised by VPNFilter for both lateral movement within a network, as well as to identify new edge devices in other networks of interest to the actor. We were able to confirm the existence and capabilities of the malware after reverse-engineering these additional modules. Previously, we had to make analytic assessments on the existence and nature of these capabilities based solely on telemetry analysis, which always leaves room for error. For example, we had previously noted what appeared to be devices compromised by VPNFilter conducting scans of large IP spaces that seemed focused on identifying other devices vulnerable to the methods of exploitation used by the actor associated with the VPNFilter malware. However, now we can discuss the specific third-stage module used for this activity. As a result of our continued research, we have furthered our understanding of the full scope of the capabilities associated with VPNFilter after examining these additional third-stage modules. As previously described, Talos identified the following seven additional third-stage modules that greatly expanded the capabilities present within VPNFilter. Each of these modules is described in detail in the following sections. 'htpx' is a third-stage module for VPNFilter. This module shares similar code with the 'ssler' module previously documented by Talos. The module relies heavily on open-source code that can be traced to the original projects based on strings present within the binary. A good example is 'libiptc.c', which is part of Netfilter. 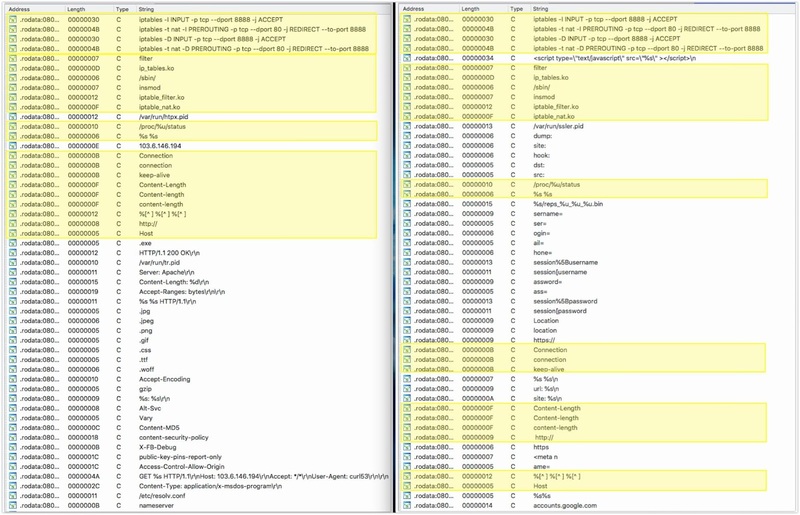 Comparison of strings between 'htpx' (left) and 'ssler' (right). The primary function present within the 'htpx' module is responsible for setting up iptables rules to forward network traffic destined for TCP port 80 to a local server running on port 8888. This redirection is accomplished by first loading kernel modules that allow for traffic management. These modules (Ip_tables.ko, Iptable_filter.ko, and Iptable_nat.ko) are loaded with the insmod shell command. It also periodically checks to ensure that these rules remain present by issuing similar delete commands then re-adding them. A temp file is also created called /var/run/htpx.pid. During our analysis of the 'htpx' module, we were unable to elicit a response from C2 infrastructure, so we were unable to observe additional module operations. During our analysis of the module binary, we identified that the module inspects HTTP communications to identify the presence of Windows executables. When they are encountered, the executable is flagged and added to a table. We assess with moderate confidence that this module could be leveraged by attackers to download a binary payload and allow for on-the-fly patching of Windows executables as they pass through compromised devices. The 'ndbr' module is a module with SSH capabilities that also has the ability to port-scan other IPs. This module uses the dropbear SSH server and client and is a modified version of the dbmulti utility version 2017.75. We have identified several modifications to the standard dropbear functionality. Like the original "dbmulti" utility, the 'ndbr' module's functionality depends either on the name of the program or the first argument passed to the program. The arguments that the 'ndbr' module accepts are dropbear, dbclient, ssh, scp, ndbr, and nmap. A description of each of these arguments can be found in the following sections. The dropbear command instructs the 'ndbr' module to operate as an SSH server. The original dropbear code uses the default SSH port (TCP/22) to listen for connections. However, the code present within the 'ndbr' module has been modified to use a default port of TCP/63914. Other modifications to the original dropbear code change the way that host keyfiles are handled. The default keyfile path has been changed to /db_key, but the 'ndbr' module does not drop this file. Instead, the buf_readfile dropbear function has been modified to load the proper key from memory when the filename parameter is equal to /db_key. Instead of using password-based authentication, the dropbear server has been modified to authenticate via a proper public key, which is also embedded in the 'ndbr' executable. A bug in this modified code mishandles connections attempting to use an incorrect public key. These authentication failures cause the ndbr SSH server to become stuck in an infinite loop. There is no indication to the client, however, that the authentication has failed. At this time, we have been unable to identify a correct key that would allow for successful authentication with the ndbr SSH server — neither of the keys embedded in the 'ndbr' module (i.e., /db_key and /cli_key) were correct, and no corresponding keys were found in any other VPNFilter-related binaries. If passed the dbclient or ssh parameter, the 'ndbr' module acts as the standard dropbear SSH command-line interface client but with modifications to its default options. As with the default keyfile with dropbear server command, the dbclient/ssh commands have a default identity file: /cli_key. At this time, we do not know what the dbclient (SSH client) is expected to connect to. If passed the nmap argument, the 'ndbr' module will perform a port scan of an IP or range of IPs. If passed the ndbr argument, the 'ndbr' module will do one of three operations based on the other parameters it is passed. The SSH commands will make use of the default keys (i.e., /db_key and /cli_key) as described above. The third parameter must begin with the word "start," or the 'ndbr' module uninstalls itself. This causes the dropbear SSH client to connect to a remote host and issue the "srv_ping" command, which is likely used to register the victim with a C2 server. The 'nm' module is used to scan and map the local subnet. It iterates through all interfaces and starts by ARP scanning for all hosts on the subnet associated with each IP assigned to the interface. Once an ARP reply is received, nm will send an ICMP echo request to the discovered host. If an ICMP echo reply is received it will continue mapping by performing a port scan, trying to connect to the following remote TCP ports on the host: 9, 21, 22, 23, 25, 37, 42, 43, 53, 69, 70, 79, 80, 88, 103, 110, 115, 118, 123, 137, 138, 139, 143, 150, 156, 161, 190, 197, 389, 443, 445, 515, 546, 547, 569, 3306, 8080 or 8291. Next, it uses the MikroTik Network Discovery Protocol (MNDP) to locate any other MikroTik devices on the local network. If a MikroTik device replies to the MNDP ping, nm extracts the MAC address, system identity, version number, platform type, uptime in seconds, RouterOS software ID, RouterBoard model, and interface name from the discovered device. 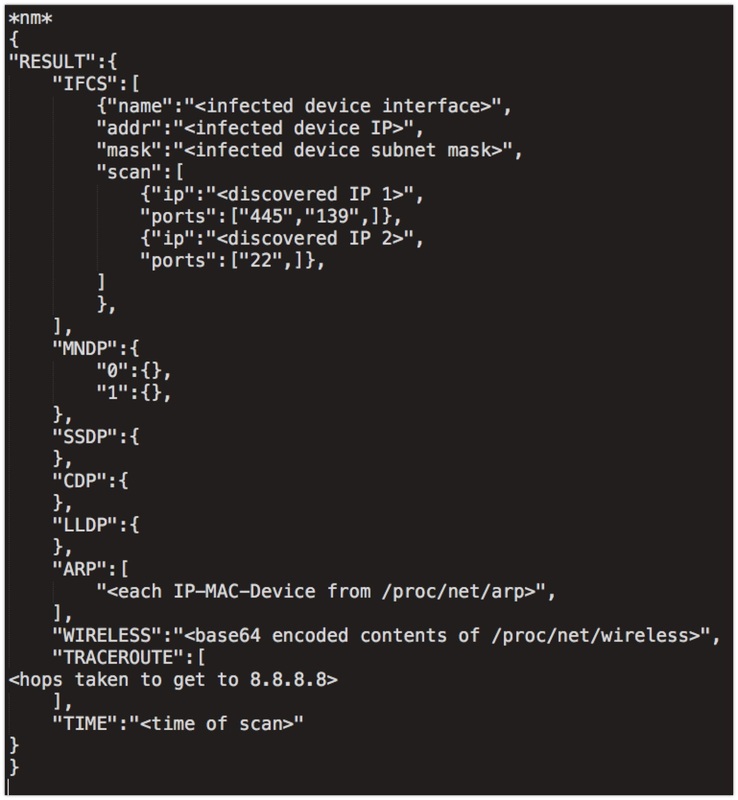 The nm module looks in /proc/net/arp to get information about the infected device's ARP table, revealing the IP and MAC addresses of neighboring devices. Next, the entire contents of /proc/net/wireless are gathered. The module performs a traceroute by first creating a TCP connection to 8.8.8.8:53 to confirm its availability (no data is sent), then ICMP echo requests are repeatedly sent to this IP with increasing TTLs. The code responsible for the SSDP, CDP and LLDP functions was present within the module but was never called in the samples analyzed and therefore will always be empty. The nm module requires three command line arguments to operate properly, but only the first parameter is used. Like several other modules, the first parameter is a folder, and this is the location where the data is permanently saved. The final task performed by the nm module is the moving of the temporary .bin file containing the results of the scan to a folder specified as the first command line argument, ostensibly for later exfiltration by the main VPNFilter process. After adding this rule, netfilter waits 30 seconds and then deletes this rule. If there is still time remaining based on the '# of minutes' value, this process begins again. The addition and deletion loop ensures that the rule persists in the event the rule is deleted from the device. Once the number of minutes has elapsed, the program exits. Signal handlers are also installed at the beginning of the netfilter program that deletes the iptables rule and then exit if the program receives either a SIGINT or SIGTERM. This is done so the device works as normal in the event someone manually terminates the netfilter program. Finally, the 'unblock' argument can be used to delete the iptables rule that was previously added using the 'block' argument. Although there are no other code paths possible, there are indications that there is or could have been something more to this module. This indicates that the netfilter module may have been designed to deny access to specific forms of encrypted applications, possibly in an attempt to herd victim communications to a service that the actor preferred they use. Interestingly, Telegram, an extremely popular encrypted chat application, is missing from the list. However, we were unable to find any references to these strings in the code. All versions of netfilter that we have samples for have this same IP range list but do not appear to use it. It's possible that the samples we have are incomplete. The iptables rule that is added by the netfilter module drops TCP packets with the PUSH flag set. This rule would likely use iptables rules that block all packets not just TCP packets with the PUSH flag set if its purpose is to provide attackers with the ability to launch denial-of-service attacks using compromised devices. Typically, a rule like this would be useful as part of a man-in-the-middle attack enabling attackers with access to the devices to intercept forwarded traffic, manipulate it, then manually forward it. This might explain the list of CIDR ranges as a list of IPs to intercept. We were unable to locate any indication of this sort of functionality present within the samples that were analyzed. We have concluded that the IPs are not used. This may be due to them being left over from an older version of the netfilter module, functionality that has not yet been implemented, or there may be modifications to the statically linked iptables library made by the malware authors that we haven't found yet. The VPNFilter authors have modified open-source code before (e.g. 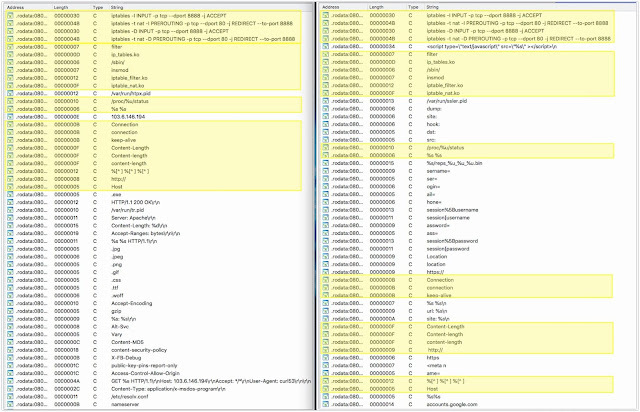 the ndbr module), so it's not unexpected that they would change the libiptc code linked in the netfilter module. These rules cause any traffic passing through the infected device that is destined to IP1:PORT1 to be redirected to IP2:PORT2 instead. The second rule then changes the source address of the rerouted traffic to that of the infected device to ensure the responses are sent back to the infected device. As a precaution, before installing the iptables rules, the portforwarding module first checks that IP2 is available by creating a socket connection to IP2 on PORT2. However, no data is sent before the socket is closed. Like other modules that manipulate iptables, the portforwarding module enters a loop that adds the rules, waits a period of time, deletes the rules and then adds them again to ensure that the rules persist on the device even if they are manually deleted. The socks5proxy module is a SOCKS5 proxy server that appears to be based on the open-source project shadowsocks. The server uses no authentication and is hardcoded to listen on TCP port 5380. Before the server is started, socks5proxy forks to connect to a C2 server specified in arguments supplied to the module. If the server does not respond within a few seconds, the fork kills its parent process (the server) and then exits. The C2 server can respond with commands to execute normally or terminate the server. The socks5proxy module verifies the argument count is greater than 1, but the process crashes with a SIGSEV signal if two arguments are given, indicating that there may be limited or poor quality control during some phases of development for this malware toolchain. The tcpvpn module is a Reverse-TCP VPN, designed to allow a remote attacker to access internal networks behind infected devices. It accomplishes this by beaconing to a remote server, which could be set up like a TunTap device to forward packets over the TCP connection. The connection is seen as outbound by network devices, which may help the module bypass simple firewalls or NAT issues. This module is similar in concept to penetration testing software Cobalt Strike's VPN Pivoting. Which are sandwiched between the port numbers of the current connection (e.g., "58586!;H*rK|_MwS+E!-!^yC=yJTh.ke:VynEz-~;:-Q;kQ^w^-~S;QEZh6^jgf_4RzsG80"). During our research into VPNFilter, we needed to determine how some of the devices were compromised. While examining the MikroTik series of devices, we noticed an open port (TCP 8291) and that the configuration tool "Winbox" uses that port for communication. The traffic from these devices appeared as large blobs of binary data, so we weren't able to determine potential avenues of access using this protocol without a protocol dissector (which to our knowledge, didn't exist publicly). We decided to develop our protocol dissector for use with packet analysis tools such as Wireshark to learn more about the protocol, which would allow us to design effective rules to prevent future infections once potential attack vectors were discovered. An example of such an attack vector is CVE-2018-14847 which allows an attacker to perform a directory traversal for unauthenticated credential recovery. The dissector proved extremely helpful when we wrote coverage for this vulnerability (Snort SID: 47684). While an update for this vulnerability has been released, we think it's essential for security professionals to be able to monitor this traffic to help identify any other potentially malicious traffic. Privacy can still be maintained by ensuring that you either use "secure mode" to encrypt communications or download the latest Winbox client which communicates over encrypted channels only. This tool will NOT decrypt encrypted communications. The latest MikroTik CCR firmware version we tested (6.43.2), enforces the usage of this newer Winbox client though this is only enforced client-side. This means that you CAN still communicate over insecure channels using a custom-made client. Therefore, we believe this Wireshark dissector remains useful because an attacker can still deliver an exploit without having to reimplement said secure communications. What is the "Winbox Protocol?" The term "Winbox" comes from the Winbox client offered by MikroTik as an alternative to the web GUI. From the official documentation, Winbox is a small utility that allows for the administration of MikroTik RouterOS using a fast and simple GUI. It is a native Win32 binary but can be run on Linux and MacOS (OSX) using Wine, an open-source compatibility layer. All Winbox interface functions are as close as possible to mirroring the console functions — that is why there are no Winbox sections in the manual. Some of the advanced and critical system configurations are not possible from Winbox, like changing the MAC address on an interface. The term "Winbox Protocol" is not official, as far as we know. It's simply the term we chose since it matches the name of their client. Installation is simple, and since this is a LUA-based dissector, recompilation is not necessary. 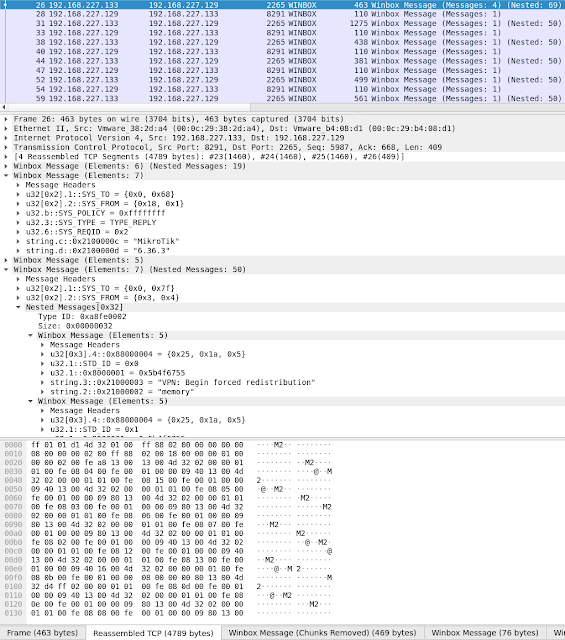 Simply drop the Winbox_Dissector.lua file into your /$HOME/.wireshark/plugins folder. By default, any TCP traffic to or from TCP port 8291 will be properly decoded as Winbox traffic once the dissector is installed. While a single message from the client/server to its destination would be preferable for parsing purposes, this is not always the case and observing live communications proved that there are many ways that Winbox messages can be formatted and sent. Multiple messages sent in the same packet. 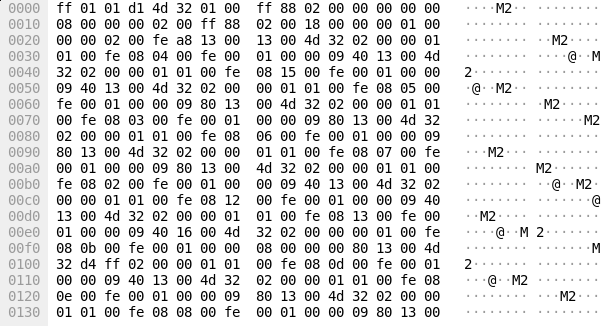 Messages containing one or more two-byte "chunks" that need to be removed before parsing. 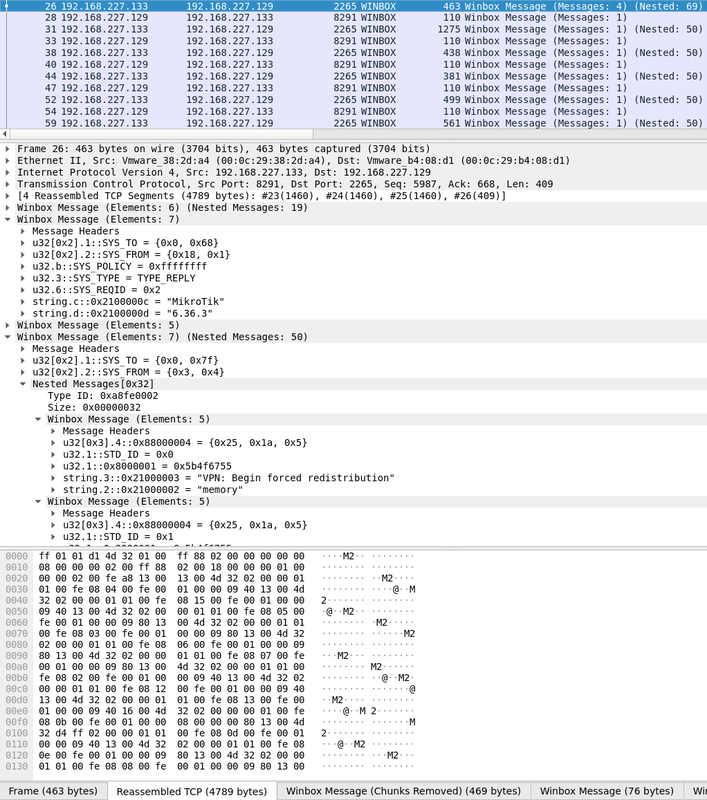 Messages too long for a single packet — TCP reassembly applied. To improve the security community's ability to analyze these communications and to monitor for threats that may attempt to take advantage of the Winbox Protocol, Cisco Talos is releasing this dissector for public use. For additional information and to obtain the dissector, please see the GitHub repository here. As a result of the capabilities we previously discovered in VPNFilter coupled with our new findings, we now confirm that VPNFilter provides attackers all of the functionality required to leverage compromised network and storage devices to further pivot into and attack systems within the network environments that are being targeted. It also allows attackers to leverage their access to sensitive systems such as gateway and routing devices to perform activities such as network mapping and endpoint exploitation, network communications monitoring and traffic manipulation, among other serious threats. Another dangerous capability provided by VPNFilter is the ability to turn compromised devices into proxies that could be leveraged to obfuscate the source of future, unrelated attacks by making it appear as if the attacks originate from networks previously compromised by VPNFilter. The sophisticated nature of this framework further illustrates the advanced capabilities of the threat actors making use of it, as well as the need for organizations to deploy robust defensive architectures to combat threats such as VPNFilter. How did the actor gain initial access to affected devices? While we strongly assess that they utilized widely known, public vulnerabilities based on the makes/models affected by VPNFilter, we still don't have definitive proof of this. Is the actor attempting to reconstitute their access? Based on our telemetry and information from our partners, it appears that VPNFilter has been entirely neutralized since we and our international coalition of partners (law enforcement, intelligence organizations, and the Cyber Threat Alliance) countered the threat earlier this year. Most C2 channels for the malware have been mitigated. The stage 2 implants were non-persistent, so most have likely been cleared from infected devices. We have seen no signs of the actor attempting to reconnect with devices that may still have the persistent stage 1 with an open listener. Does this mean the actor has abandoned this expansive foothold into the small and home office (SOHO) network device space? Are they instead reconstituting their access by starting over, re-exploiting and dropping new unknown malware? Have they given up on having broad worldwide SOHO access in favor of a more tailored approach only going after specific key targets? 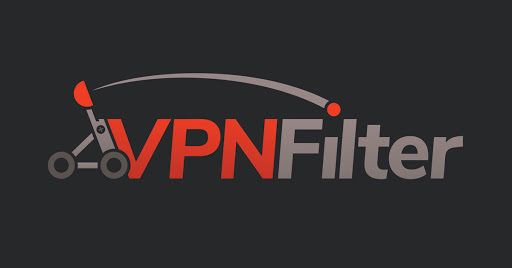 Whatever the answers may be, we know that the actor behind VPNFilter is extremely capable and driven by their mission priorities to continually maneuver to achieve their goals. In one form or another, they continue to develop and use the tools and frameworks necessary to achieve their mission objective(s).